OC Board of Supervisors acknowledges Rodger Beard’s influential role in Dana Point. DANA POINT ― Dana Point Boaters Association President Rodger Beard has retired from his position as of June 1. His status as a board member will continue through the end of 2017. Beard will remain an advisor to the organization he co-founded. 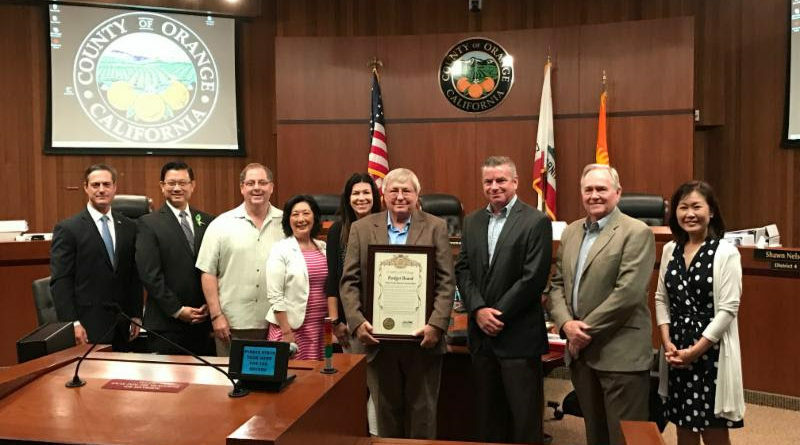 At the Orange County Board of Supervisors meeting May 23, 5th District Supervisor Lisa Bartlett thanked Beard for his contributing role with the Dana Point Harbor Revitalization Plan and the Dana Point community. “You played a big part in this entire project over the years, and I can’t thank you enough for representing the boaters and their perspective,” Bartlett continued. Beard co-founded Dana Point Boaters Association (DPBA) 10 years ago to advocate for boaters while being involved in the revitalization plan for so many years. Beard accepted a recognition award and thanked Bartlett for her role in the harbor. “It’s been a long 18 years, and in the beginning very contentious. But under Lisa’s leadership and the cooperation and support of the other shareholders that are here this morning, we’ve gotten an awful lot done. I’m very excited about our future. I do believe the revitalization is going to happen finally,” Beard said. Beard is moving out of state with his wife, Dede, whom he has been married to since dating her in high school. “We are very sad to be leaving the harbor but know leadership of DPBA is in good hands,” Beard told The Log.